Every fall the leaves on trees turn spectacular shades of red, yellow and brown. While these leaves look picturesque on trees, they soon turn crispy brown and drop to the ground. Once the leaves have fallen from their trees, homeowners have a messy lawn on their hands. For many homeowners, maintaining a tidy lawn through the winter means raking and bagging those fall leaves. While landfills will take those fall leaves, a much greener option exists. You can turn your fall leaves into nutrient rich compost in just a few seasons with virtually no work through cold process composting. Unlike hot process composting, which requires gardeners to turn the compost pile several times throughout the process to break down the refuse, cold process composting works slowly over several seasons. For this reason, gardeners also call cold process composting “slow composting.” Both hot process composting and cold process composting yield the same result: black, rich, crumbly soil that is filled with nutrients. Cold composting gardeners simply move their compost items into a pile and leave them. The process works because in the cold process, the same microorganisms that break down organic material in hot process composting still work. They just work at a slower pace at lower temperatures. Cold process composting works well for fallen leaves because hot process composting requires that the leaves reach and stay at a warmer temperature, which gardeners may find difficult to maintain in winter. Cold process composting also works well for fallen leaves because the leaf litter may contain fewer weed seeds and pathogens, two agents that hot process composting kills more effectively than cold process composting. Gardeners may also prefer cold process composting because they do not have to stir or mange a cold compost pile in winter. 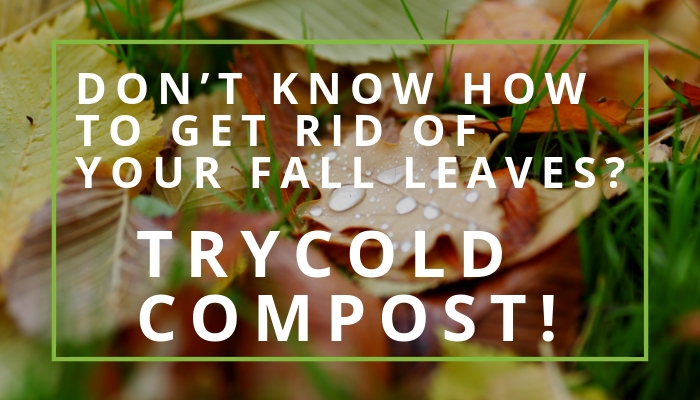 You can also cold compost by layering dead leaves directly into your garden along with layers of grass clippings, food scraps, newspaper and manure. Alternate layers of carbon-rich “brown” material such as leaves and newspaper with nitrogen-rich “green” material such as grass clippings, manure and food scraps until the pile reaches 12 inches high. Always finish your compost bed with a brown layer. Some gardeners call this version of cold compost “lasagna gardening.” You can plant your garden in spring by placing seedlings directly into the lasagna bed layers. If wild animals interfere with composting in your area by digging through your pile in search of food scraps, you can protect the compost by burying it in a hole or a trench in the soil. When you bury your compost next to or directly in the garden, the dead leaves will break down quickly in the soil thanks to the presence of microbes in the soil. By spring, your garden should be ready to plow and plant. No Replies to "Don’t Know How to Get Rid of your Fall Leaves? Try Cold Compost!"